16th ANNIVERSARY Re-Release Due to popular demand, fans can finally get their hands on this cherished, rant-filled performance! Out of print for years. As bawdy, rowdy and charming as ever. Relive the memories, or find out what you missed. “Yes! Mine’s been at my (actually stolen off a buddy) desk … for over a year waiting for a free moment to make my own CD copy of it. An official re-release would be awesome! 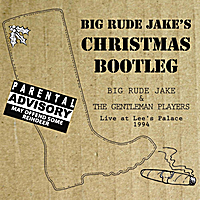 On December 23rd, 1994, Big Rude Jake and his then band, The Gentlemen Players, played to a sold-out audience at Toronto's famous Lee's Palace. That night, their stellar performance was captured in a live recording and released on cassette tape in a limited run. It was sold off the stage at concerts across Canada over the next few years, becoming a favourite among diehard fans who will fondly remember Jake's discourses on Grunge fashion, censorship and sweet tender love. Who can forget the hilarious Reindeer Rant, improvised in a fit of pique during an encore? We know. Your cassettes wore out or were 'borrowed' years ago, and there's been no way to replace them. If you still have an old tape, you may not have a functioning tape player. The wait is finally over! Due to popular demand, fans can finally get their hands on a new version of this celebrated performance! Bawdy, rowdy and charming as ever, relive the memories, or find out what you missed!